This pub offers a friendly atomsphere and a good selection of pub grub at reasonable prices, albeit not a gastro pub, it doesn't pretend to be something it isn't. Beers were limited in choice though. Been back to visit.Traditional pub with great food.Deals on the food was nice to see and the staff were helpful and polite. The day we went the quiz was on and it was fun to see the place fill up from 8.30 to 9pm when the quiz started.There was a friendly feel about the night and the music during the quiz was really good.The beer was a good selection and they even had a meat draw at 10pm. Will definately be back next time in area! We had a really good meal in here as a group of around 12 people. Service was good and the food came quickly. Very good value, main courses were around �7-10, very generous portions. Particularly good pie, and the fajitas were good too. There is an excellent playground too. 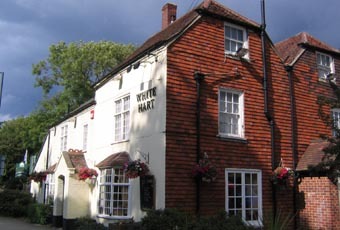 Had lunch in there today as I enjoyed going to one of their sister pubs in Sway "Hare & Hounds". Found this pub to be not as good. Nice Pint of Ringwood Bitter and my party ate the Beer BAttered Cod which I was told was good, but I found my Ham Egg Chips & peas no be below expectations. Peas Hard, Chips only warm (Nice tasting) Eggs Cold and overcooked and the Hame was sparce and full of grissle. I would recommend you go to the Hare & Hounds where the Food, wecome and surroundins are much better. Will try the other sister pub next time I am in the area called "The Smugglers".